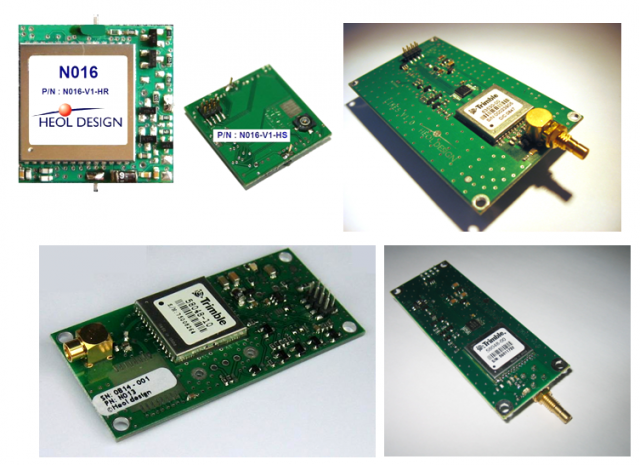 HEOL DESIGN is the first company to produce Trimble GPS receiver clone boards, which are based on the Copernicus II and RES-SMT-360 high performance GPS chipsets. These OEM board are designed for use in embedded and industrial applications requiring high accuracy positioning and timing information. They can also be used as a replacement and upgrade for users of the Trimble Lassen iQ, SQ, LP, SK2 and ACE (ACE II, ACE III iii ) receiver boards, which are now EOL (end of life), and which will suffer the rollover bug on April 6 / 7, 2019 (WNRO), displaying year 1999. The N0xx (except N016 - iQ and SQ replacement boards), have an additional feature: thanks to a switch, you can select the active antenna voltage; so you can migrate from an obsolete receiver technology to a performing one, without the need to change the antenna. Also, the N024 and N021 ( ACE and Lassen clone) integrates a processor, for matching with parity odd, and additional software features. You can buy these boards directly by contacting us by E-mail or phone.